Tampon-associated toxic shock is not usually an infection, since the causative staphylococci grow in the menstrual fluid-soaked tampon and rarely spread throughout the body. 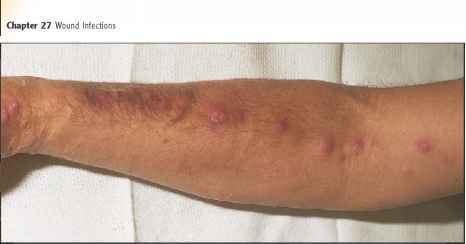 Staphylococcal toxic shock results from absorption into the bloodstream of one or more of the toxins from the site where the organisms are growing, a situation analogous to staphylococcal scalded skin syndrome. Tampons that abrade the vaginal wall probably promote toxin absorption. Toxic shock syndrome toxin-1 and the other responsible toxins, being superantigens, cause a massive release of cytokines, which in turn cause a drop in blood pressure and kidney failure, the most dangerous aspect of the illness.